There was a moment on Tuesday night when the Republican Convention looked like it just might slide right off the rails. The President had been banished from his own party. The running mate was caught in a media frenzy. And a Democrat was extolling the Republican nominee for a series of accomplishments that most delegates inside the Xcel Energy Arena deeply despise and resent. Campaign-finance restrictions, the Gang of 12 senatorial compromise on new judges, immigration reform, the acknowledgement of global warming  as Senator Joseph Lieberman ticked through the record of John McCain, it was so quiet you could almost hear the hum of the air-conditioning. Still, a starving man won't pass up gruel just because it's not Mom's pot roast. And after Lieberman gave the delegates that first mouthful of stewed maverick, things started looking up. She took one of John McCain's biggest weaknesses among Republicans and turned it into a strength. The conservative Christian leader Richard Land has said that what makes the base of the party so uncomfortable with McCain is not so much his unorthodoxy as his sheer unpredictability. They're never sure what he'll do next. But along comes Palin, McCain's wildest move yet  the Top Gun fighter jock, alone in his jet, throwing the stick hard over just to see what might happen  and she turns out to be everything the base could dream of. For at least one night, they saw a Reagan in heels, and they decided maybe they could trust McCain with their real priority: the Supreme Court. On another level, Palin thrilled the Republicans by showing that Barack Obama has vulnerabilities, and she knows how to poke them. When McCain sprang his surprise choice on the public, the initial analysis held that by putting the rookie Governor of Alaska on the ticket he had erased the issue of experience. But like a lot of early thinking, that was wrong. Palin put the experience issue front and center, because suddenly America was seriously weighing the relative qualifications of the Democratic nominee versus the recent mayor of Wasilla. That's a comparison Obama loses simply by being involved in it. Still another layer: Palin signaled to a disheartened GOP that there's a future. Republicans know that their party has plunged in popularity, and most of them will agree with John McCain that they have themselves to blame. "We lost the trust of the American people when some Republicans gave in to the temptations of corruption," McCain told the delegates. "We lost their trust when we valued our power over our principles." After decades of promising smaller government, fiscal discipline and military competence, the GOP got the reins of government, expanded its power, blew out the budget and blundered through a war. In Palin, the dispirited GOP glimpsed the glowing horizon of a brighter tomorrow, whether it's her or someone who comes behind her. Democrats who gathered four years ago in Boston to nominate a candidate they didn't really like, and found their thrill in the eruption of Obama onto the scene should relate. As for Palin's impact outside the hall, out in America, we'll have to see. An ABC News poll found that half the country believes Palin is unprepared for the vice presidency, a concern that may be more crucial in light of McCain's age. Some critics found her too mean or too right-wing. Over the next two months she will either sweeten or sour with the public, but certainly she will shrink, as the country focuses on the presidential debates. What McCain needed now was a jolt to awaken his own party, and she was it. 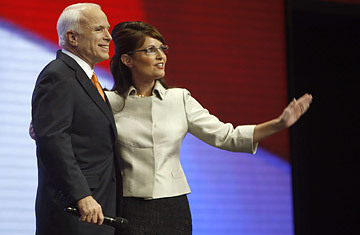 Palin's tough tone allowed McCain to deliver the speech he wanted to make, the one holding himself above the bitter business of partisanship. She got that out of the way. She rallied the party while he tried to transcend it. If you were to boil the past two eventful weeks down to their essence, you would have the Democrats wrapping McCain in the dead arms of the Bush presidency, and McCain trying to wriggle free. You'd have Democrats lasering in on the GOP of Rumsfeld, DeLay and Abramoff, and McCain reaching back to remind America of "the party of Lincoln, Roosevelt and Reagan." Give us one more chance, he said, promising to "get back to basics." In a two-party system, each party must be broad enough to haul in diverse constituencies, so the idea of party unity is inevitably a screen that hides factions and rivalries. In St. Paul, the GOP assembled its screen with more than the usual amount of duct tape and staples showing. If they couldn't agree on politics, they could agree that John McCain is a patriot. They could rally to the conservative dog-whistle of low taxes and free enterprise. They could match the audacity of hope with the audacity of a thrice-married New York City mayor pretending to be horrified by the "cosmopolitan" Obama. They've won seven of the past 10 presidential elections, and as battered and tired as they are, they still know how to get up for the championship game. A final note, a glance at the forest instead of the trees: No matter how it ends, this contest is now a lock for the history books. Our grandchildren will study it in school. Next January, barring some cataclysm, an oath sworn through the centuries exclusively by white men will be taken by an African-American man or a woman.